Earthenware pot for Keiller's of Dundee marmalade, made for them by C J Maling (identified and dated by "Maling K" on base). 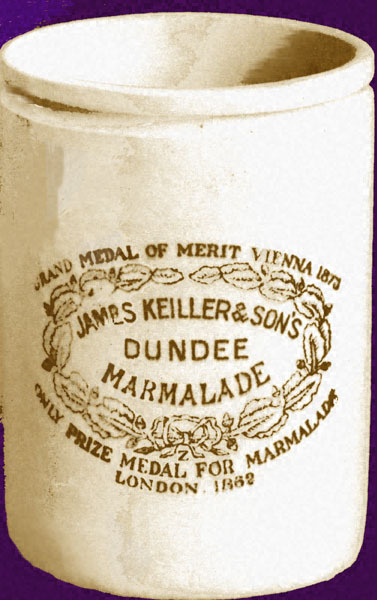 Keiller's began as a confectionery business in Dundee at the end of the 18th/start of the 19th century. Contrary to popular belief, the firm did not invent marmalade, and the story of a cargo of Seville oranges bought cheaply because they were going to waste by Mrs Keiller is apocryphal. However, it was the first Scottish manufacturer to produce on a commercial scale. The company's largest period of growth was the third quarter of the 19th century when Alex Keiller was senior partner. He expanded production to a plant in Guernsey and, as confectioners, Keiller's dwarfed Cadbury and Rowntree.